This article is about the company. 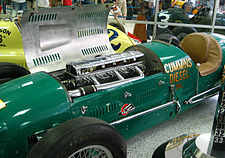 For other uses, see Cummins (disambiguation). 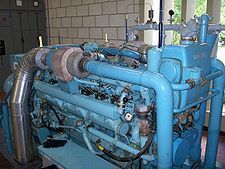 Cummins is an American Fortune 500 corporation that designs, manufactures, and distributes engines, filtration, and power generation products. Cummins also services engines and related equipment, including fuel systems, controls, air handling, filtration, emission control, electrical power generation systems, and semi trucks. Headquartered in Columbus, Indiana, United States, Cummins sells in approximately 190 countries and territories through a network of more than 600 company-owned and independent distributors and approximately 6,000 dealers. Cummins reported net income of $999 million on sales of $20.4 billion in 2017. The Cummins Engine Company was founded in Columbus, Indiana, in 1919 by William Glanton Irwin and Clessie Cummins, a local mechanic. It focused on developing the diesel engine invented 20 years earlier, but in spite of several well publicized endurance trials, it was not until 1933 that their Model H, used in small railroad switchers, proved successful. Cummins N Series engines became the industry leader in the post-World War II road building boom in the United States, with more than half the heavy duty truck market from 1952 to 1959. In the 1960s, the company opened an assembly plant in Shotts, Scotland. By 2013, Cummins had operations in 197 countries and territories. Cummins Engine Business Unit consists of Aftermarket support, Mid-Range, Heavy-Duty, and High-Power Engines. Cummins manufactures and markets a complete line of diesel and natural gas-powered engines for on-highway and off-highway use. Its markets include heavy-and medium-duty truck, bus, recreational vehicle (RV), light-duty automotive and a number of industrial uses including, construction, mining, marine, oil and gas, railroad and military equipment. For the general public, the most visible Cummins product may be the 5.9-liter in-line six-cylinder engine used in the Dodge Ram light duty pickups starting in 1988.5. In 2007.5, a 6.7-liter version of the Cummins straight six engine became optional on the RAM pickup. In 2008, Cummins was a named defendant in a class action suit related to 1998-2001 model year Chrysler Dodge Ram trucks, model 2500 or 3500, originally equipped with a Cummins ISB 5.9 liter diesel engine built using a pattern 53 Block. The case has been settled, but some qualified Chrysler owners may receive $500 for repairs to the block, which was alleged to crack and create a coolant leak. In April 2013, Cummins utilized technology developed by Westport Innovations to begin shipping large natural gas fueled engines to truck manufacturers in the United States as trucking companies began converting portions of their fleets to natural gas and the natural gas distribution network in the United States began to expand. Cummins has a Technical Centre in Darlington UK, where it develops products for the European, Middle Eastern and Asian markets. 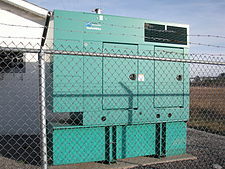 A Cummins Power Solutions unit at the Shenandoah National Park office outside of Luray, Virginia. Cummins Power Systems Business Unit consists of Alternators, Automatic Transfer Switches, Commercial Power Systems, Consumer Systems, Engines, and Paralleling Systems. Cummins Power Systems is a global provider of power generation systems, components and services in standby power, distributed power generation, as well as auxiliary power in mobile applications to meet the needs of a diversified customer base. All of the above solutions stem from Cummins Onan, of which products are still in service today. This Business Unit was formed recently, following a merge of the Power Generation Unit and High Horsepower Sub-Division. On August 22, 2017, United Rentals announced it had acquired all mobile power generation assets from Cummins. To maintain fleet and customer service continuity, a small number of Cummins employees joined United Rentals. Cummins Component Business Unit consists of Emission Solutions, Filtration (Fleetguard), Fuel Systems, Turbo Technologies (Holset), and Electronics. With regards to Turbo Technologies, Cummins designs and manufactures turbochargers and related products, on a global scale, for diesel engines above 3 liters. In regard to Emission Solutions, Cummins develops and supplies catalytic exhaust systems and related products to the medium-and heavy-duty commercial diesel engine markets. In regard to Filtration, Cummins designs, manufactures and distributes heavy-duty and light-duty air, fuel, hydraulic and lube filtration, chemicals and exhaust system technology products for diesel and gas-powered equipment. With regards to Electronics, Cummins designs engine control units and sensors for Cummins diesel engines. Cummins Distribution Business consists of Engine and Power Generation Distribution as well as Service and Parts. The distribution unit of Cummins consists of 17 Cummins owned distributors and 10 joint ventures, covering 90 countries and territories through 234 locations. The Holset Engineering Co. was a British company that produced turbochargers, primarily for diesel and heavy duty applications. In 1973 the company was purchased by Cummins after briefly being owned by the Hanson Trust. Holset now operates facilities in China, India, Brazil, the Netherlands, the United Kingdom, and the United States. In 2006, the division officially changed its name to Cummins Turbo Technologies to be identified more closely with its parent company. The turbocharger products still use the Holset brand name. In 1990 Cummins began acquisition of Onan and completed it in 1992. Since then, Onan has evolved into Cummins Power Generation (now Cummins Power Systems), a wholly invested division of Cummins. The Onan name continues to be used for modern versions of their traditional engine-driven generators for RV, marine, commercial mobility, home standby, and portable use. Fun Roads Website and Facebook page will also be rebranded to Cummins RV. Cummins Inc. (NYSE: CMI) announced that it will be unifying its brand strategy across its Power Systems business segment, which provides high-speed engines from 760 – 4400hp and power generation equipment from 2-3,500kW, including standby and prime power gen sets, alternators, switchgear and other components. Currently the portfolio features the Cummins, Cummins Power Generation and Cummins Onan brands. With immediate effect, the branding will be consolidated under the Cummins brand. The Cummins Power Generation and Cummins Onan brands will be retired and the Onan name synonymous with mobile gensets, will be repositioned as a generator product line under the newly unified Cummins brand in the RV market. Exhaust and emissions after-treatment company Nelson Industries was purchased in 1999, due to the increasing importance of exhaust after-treatment systems for meeting future emissions standards. The division officially changed its name to Cummins Emission Solutions, in order to be identified more closely with their parent company. Cummins has some joint ventures with Chinese manufacturer, such as Dongfeng Cummins, a joint venture with Dongfeng Automobile Company, as well as Guangxi Cummins Industrial Power with LiuGong. Other entities were Cummins Beijing, Chongqing Cummins Engine, Xi’an Cummins Engine, Wuxi Newage Alternators, Xiangfan Fleetguard, Wuxi Cummins Turbo Technologies. In 1996 Cummins Inc. bought Kirloskar shares. Now its Cummins Inc. subsidiary. As of 2013, the Cummins group had revenues of over $1.5 billion, 20 factories and 9000 employees in India. Cummins does a significant part of its R&D in India at the Cummins Research and Technology centre that was set up in 2003. Also, Cummins is building an advanced technical centre in Pune which will house over 2000 engineers. Cummins India has also made significant contributions to local skill development by establishing the MKSSS's Cummins College of Engineering for Women, a women-only engineering college in Pune. ISB 6.7-liter I6 - used in third and fourth generation Ram 2500-5500 trucks, medium duty trucks such as, Freightliner and International. Used in Kenworth and Peterbilt called the Paccar PX6 or PX7. Cummins Aeos - A electric-powered conventional semi truck. ^ a b "US SEC: Form 10-K Cummins Inc". U.S. Securities and Exchange Commission. Retrieved May 16, 2018. ^ "Cummins Fortune 500". Fortune. Retrieved May 16, 2018. ^ Wren, James A.; Wren, Genevieve (1979). Motor Trucks of America. Ann Arbor MI: The University of Michigan Press. p. 124. ISBN 0-472-06313-8. ^ Pinkpank, Jerry A (1973). The Second Diesel Spotter’s Guide. Kalmbach Books. pp. 138, 189, 192. LCCN 66-22894. ^ Wren (1979), p. 232. ^ a b "Cummins 5.9 and 6.7 liter inline six-cylinder diesel engines". Allpar.com. October 27, 2010. ^ Diane Cardwell; Clifford Krauss (April 22, 2013). "Trucking Industry Is Set to Expand Its Use of Natural Gas". The New York Times. Retrieved April 23, 2013. 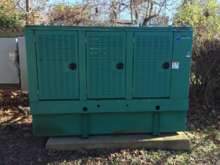 ^ "United Rentals Expands Power & HVAC Fleet with Acquisition of Portable Power Assets". unitedrentals.com. 22 August 2017. Retrieved 15 March 2018. ^ a b "Worldwide Manufacturing Locations". Cummins. 1 March 2008. Retrieved 14 September 2017. ^ Mishra, Ashish K.; Mohile, Shally Seth (25 September 2014). "Innovation pays off for Cummins". Live Mint (HT Media Ltd.). Archived from the original on 7 February 2015. ^ "The College". Pune, India: Cummins College of Engineering for Women. Archived from the original on 7 February 2015. Wikimedia Commons has media related to Holset Engineering.